The American monetary system is based on the dollar — so what better coin can you collect than the silver dollar? …Or, better yet, early American silver dollars? Yes, the early American silver dollars (those made from 1794 to 1803) are truly historic in that they represent the basis of early American money. Today, we’ll look at the Draped Bust silver dollar, which is perhaps one of the most famous of the early American coin designs. Following a short run of the Flowing Hair design of 1794 and early 1795, the United States Mint oversaw the redesign of the dollar coin. The new obverse design shows a robust profile of Miss Liberty. 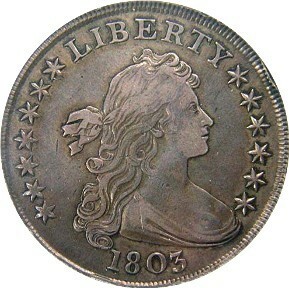 For the first few years of the Draped Bust design, the reverse design — that of a small eagle — remained unchanged from the Flowing Hair silver dollar era. In 1798, the U.S. Mint redesigned the reverse of the Draped Bust silver dollar, replacing the small eagle with a stately heraldic eagle. Robert Scot was the man behind the Draped Bust silver dollar. However, the Draped Bust design attributed to Scot may have been, at least in part, inspired by a picture famous artist Gilbert Stuart drew of Bingham. Bingham was a friend of some major politicians of the time, including George Washington and Thomas Jefferson — and she was the daughter of Thomas Willing, president of the First Bank of the United States! Though a little over 1 million Draped Bust silver dollars were made for circulation from 1795 through 1803, not nearly that many survive today. Most were melted down, damaged, and lost to the hands of time. In fact, numismatic icon Walter Breen had once suggested that only 3% percent may still exist. Circulated Draped Bust silver dollars are far more common than uncirculated examples. Though any Draped Bust dollar that hasn’t been cleaned, has nice color, no holes, and is without serious damage is a true treasure and often considered to be among the rare U.S. coins. Selling old coins like Draped Bust dollars will draw buying coin collectors to swirl around your coin like hungry sharks! There are dozens of design varieties which keep die-hard Draped Bust silver dollar collectors busy. *Values are based on approximate retail prices for Draped Bust Dollars in Good-4 grade. No post about the Draped Bust silver dollar would be complete without a note about the 1804 Draped Bust silver dollar. In all fairness, there are a few coins even rarer than the 1804 Draped Bust silver dollar — but there are none more popular — and for good reason!